Objective: A minimally invasive approach to hepatobiliary reconstruction can be technically difficult due to the need to suture a fine structure in an enclosed space, intimately related to critical vascular structures, often with significant adhesions or fibrosis. Using the da Vinci surgical system can aid in visualization and maneuverability, facilitating the dissection and anastomosis in this area. We examined our short-term outcomes with robot-assisted laparoscopic Roux-en-Y hepaticojejunostomy reconstruction. Methods: We attempted a minimally invasive approach to biliary reconstruction in 8 patients from June 2007 to August 2008. Data from patients undergoing a minimally invasive approach to roux-en-Y hepaticojejunostomy were prospectively entered into a database, and patient characteristics, indications, operative data, and perioperative outcomes were recorded and analyzed retrospectively. 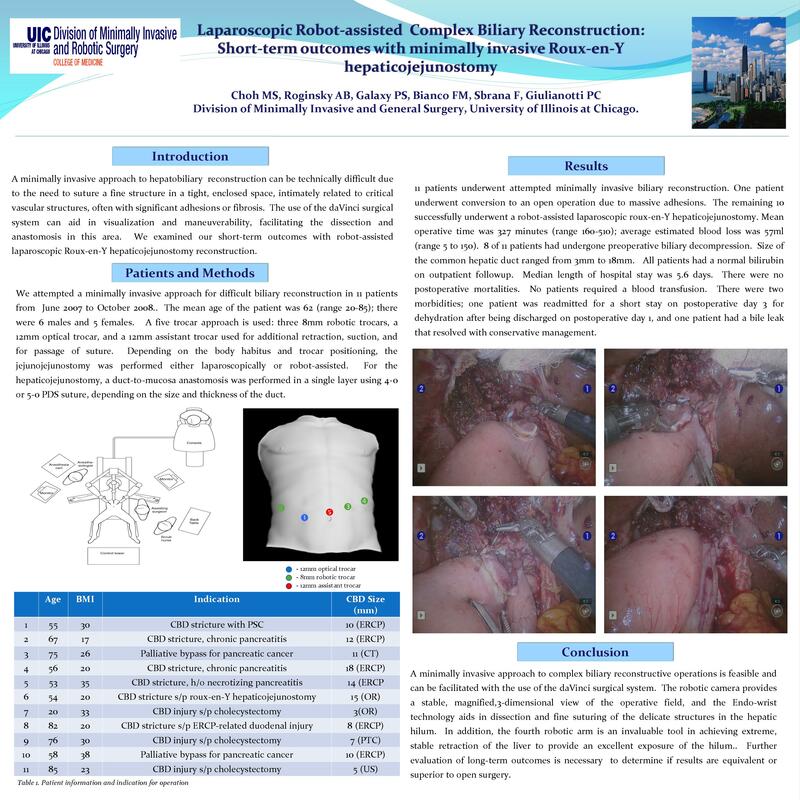 8 patients were explored laparoscopically with the intention of a minimally invasive biliary reconstruction. One patient underwent conversion to an open operation due to massive adhesions. The remaining 7 successfully underwent a robot-assisted laparoscopic roux-en-Y hepaticojejunostomy. The mean age of the patients was 58 (range 20-82); there were 5 males and 3 females. Results: Indications for reconstruction included 3 benign common bile duct strictures from pancreatitis, 1 idiopathic benign stricture, 1 previous roux-en-Y hepaticojejunostomy reconstruction, 1 retained common bile duct stone after ERCP-related duodenal injury, 1 obstruction from pancreatic cancer, and 1 common bile duct injury after laparoscopic cholecystectomy. Mean operative time was 353 minutes (range 160-510); average estimated blood loss was 70ml (range 5 to 130ml). 6 of 8 patients had undergone preoperative biliary decompression. Size of the common hepatic duct ranged from 3mm to 18mm. Mean preoperative bilirubin was 1.9; all patients had a normal bilirubin by postoperative day 2. Average length of hospital stay was 4.9 days. There was no postoperative morbidity or mortality. No patients required a blood transfusion. One patient was readmitted for a short stay on postoperative day 3 for dehydration after being discharged on postoperative day 1. Conclusion: A minimally invasive approach to complex biliary reconstructive operations is feasible and can be facilitated with the use of the da Vinci surgical system. The robotic camera provides a stable, magnified view of the operative field, and the Endo-wrist technology aids in the dissection and suturing of the delicate structures in the hepatic hilum. In addition, the fourth robotic arm is an invaluable tool in achieving extreme, stable retraction of the liver for exposure of the hilum. Further evaluation of long-term outcomes is necessary to determine if results are equivalent to traditional open surgery.